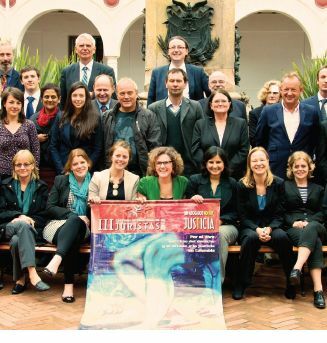 The Caravana delegation of August 2012 was the third in a series of large international delegations of lawyers in response to invitations from the Colombian national association ACADEHUM (Asociacion Colombiana de Abogados de Derechos Humanos), formerly known as ACADEUM. The first delegation in August 2008 consisted of 70 lawyers from Europe and North and South America. This was extended in 2010 to include lawyers from 15 different countries in the Americas, Europe and Asia. By September 2012 over 160 delegates had visited Colombia as part of the Caravana. The aim of the Caravana is to provide a spotlight on the situation of human rights lawyers in Colombia, and to advocate on their behalf for their protection so that they may go about their professional work without threats, attacks and assassinations. During all three visits delegates heard evidence of the high rate of impunity, which is still estimated to be 97% for some crimes. A list of 4,400 incidents against lawyers between 2002 and 2012 was presented to the Head of the Human Rights Division in the Deputy Attorney General’s Office. The Caravana supports the UN Special Rapporteurs on the Independence of Judges and Lawyers and on the Situation of Human Rights Defenders in calling for improvements in the investigation, prosecution and conviction of the perpetrators of human rights abuses. The Caravana is still profoundly disappointed with the continuing victimisation and stigmatisation of defence lawyers and the government’s tendency to issue statements critical of their work. The Caravana was happy to welcome Judges among the Caravana delegates and a fuller report of their investigation is published separately. Evidence from their meetings is included in this report, including disturbing accounts of the persecution of judges. A sub delegation of the Caravana – consisting of four lawyers from the Alliance for Lawyers at Risk, a UK based network of senior lawyers – had a separate, complementary agenda. They met with lawyers, human rights defenders, and members of campesino, Afro-Colombian and indigenous communities affected by mining and palm oil industries to see in what ways the international legal community can assist in the implementation of the United Nations principles on Business and Human Rights. Their report is also published separately. The Caravana welcomed the peace talks between the government and the guerrillas which commenced as the delegation arrived but was concerned at the lack of participation by civil society organisations in the process. The context of the 2012 Caravana included observations on the working of the new Victims and Land Restitution Law; the impact of the mining and extractive industries; violation of the rights of indigenous peoples; continued activities of paramilitaries; the violation of prisoners’ rights; the persecution of sectors other than lawyers and the judiciary including Trade Unionists, Afro-Colombian communities, and human rights defenders. The report also examines impunity; the rule of law and access to justice; as well as evidence of limited progress in prosecuting the perpetrators of extra judicial killings, forced disappearances and sexual violence. While encouraged by the enactment of the new Victims and Land Restitution Law (Law 1448 of 2011), which complements the existing Justice and Peace Law (Law 975 of 2005), the Caravana believes that these laws do not go far enough to right the wrongs visited on hundreds of thousands of Colombian citizens during the last 25 years. For those attempting to use Law 1448 to retrieve their land, the process is also one that engenders a substantial amount of risk; 30 community leaders who were demanding the return of their land have been assassinated since Law 1448 was passed. The delegates heard evidence of a lack of resources in the justice system which has a serious impact on the ability of prosecutors and the judiciary to ensure the proper functioning of the judicial system. The report also discusses other factors which impact significantly on the functioning of the judicial system, namely: lack of respect for the judiciary; problems in tackling impunity from the prosecutors’ perspective; failure to investigate and prosecute paramilitary attacks; improper reliance on military justice and deficiencies in the Justice and Peace Law. The most serious concern for the Caravana is that threats, attacks, persecution and the killing of lawyers continue. Lawyers are hampered in their work by having to defend spurious proceedings against themselves and by burglaries of their offices, and cyber-attacks on websites and vandalism of their office equipment. The legacy of the surveillance by the state intelligence agency (DAS, Departamento Administrativo de Seguridad) has interfered with the protective measures which some lawyers should receive. In addition to the problems of state interference in their work are the risks that many lawyers face of physical violence and possible assassination. The lawyers most at risk work with clients such as political prisoners, those with problems related to the use of or rights to land, those accused of collaborating with the guerrillas, and representatives of minority or repressed communities. After conducting the regional visits the delegates returned to Bogota and met with various national authorities, including the Coordinator of the Presidential Programme for Human Rights and International Humanitarian Law, the National Protection Unit and the Land Restitution Unit. Delegates also met with officials from their own Embassies, and the European Union delegation. The Caravana is concerned that there is a lack of effective protection for human rights defenders from the new National Protection Unit. Delegates heard reports of inadequate resources and a lack of trust in the unit, which in part stems from concerns about the participation of DAS in the process prior to its abolition in 2011. There are also concerns about the efficacy of the land restitution process and the ability of the Land Restitution Unit and the National Protection Unit to collaborate effectively to protect those people who are using the new law to reclaim their land. The work of the Caravana does not end when the visit to Colombia finishes. Reporting on the visit and accounting to the professional associations of the lawyers who participated in the Caravana is a vital way of supporting access to justice, the rule of law and human rights in Colombia. The Caravana’s network of international lawyers will continue to support fellow lawyers and human rights defenders in Colombia and will monitor events in order to help protect and promote justice for its citizens.